When Melissa and I went to the Taylor Swift concert, we had booked a flight back home the day after. However, we woke-up the next day to a text message from the airline, letting us know that our flight had been cancelled. Some searching on social media and the internet pointed us to the cause of the cancellation: extreme winds had closed the destination airport and no flights were getting in or out. So Melissa got on the phone with the airline to sort out alternative flights for tomorrow, and I got on the phone with my Auckland family to take them up on the offer they made the other day when I let them know that I was in their city: that if I ever needed some help or was stranded anywhere, they’d be happy to help. I hadn’t seen the Auckland contingent of my extended family in a long time: my cousin, Carolita; her mum / my auntie, Tita Bubot (‘Tita’ is like the Filipino equivalent of ‘auntie’, and Bubot is her nickname. The Philippines is all about nicknames, most people going by them instead of their birth names. ); and all of Carolita’s daughters, whom I call my nieces just to keep family names simplified (I remember looking-up what the words for my relationship to Carolita’s daughters is actually called, and I think it turned out to be some ridiculous mouthful like ‘first cousins once removed’). I think the last time I saw any of them in person was for Christmas / New Year’s 2007/2008 when Tita Bubot and one of my nieces, Chelsea, and my immediate family went to the Philippines to visit the whole family there. My mother was one of 11 children, so I have a very wide family tree. I remember trying to draw the whole thing for Chelsea in the Philippines to explain why one of her ‘uncles’ was younger than her, and I quickly ran out of paper along the horizontal axis. Nowadays I use online family tree websites as a reference in-case I need to recall whose mother/father/son/daughter is whose so I don’t feel like a total idiot with regards to my own family. Most of the families stayed in the Philippines, but Carolita’s family came to Auckland, and mine followed soon afterwards. Growing-up, we followed my dad wherever he could find work. His first jobs in New Zealand were in Auckland, so Carolita and I lived pretty close to each other. Our families would mingle quite often, and I looked to Carolita as an older sister. A few years later my dad would take a job in another city a few hours away, and our family reunions, where we would go back to Auckland to stay at Carolita’s family’s house, would become once-a-year affairs. It was around then that my ‘poos and wees’ phase (the time when I thought feces and urine were the funniest things and at the same time the most insulting words I could throw at someone) and my ‘girls are yucky’ phase came into effect, so when I visited Carolita, we didn’t always get along. I don’t remember too much of these days. A few years after that, my dad would land a job even farther away, and so our family would move once again, making our family reunions even rarer. The 8-hour drive to Auckland was suddenly too much of a drive to make to see Carolita and co - the era of cheap airfares didn’t yet exist - so I think we only saw each other twice in the next 10 or so years. By then I had out-grown several, if not all, of my juvenile phases, and Carolita and I started getting along much better. We also made some visits when Carolita started having kids of her own. It’s these years that I remember the best. So after some texts and calls, we organized for Melissa and I to stay in the spare rooms of my auntie’s house. It had been some 5 years since I had last seen my auntie, some 8 years since I had last seen Carolita (thank God for text messaging and Facebook to fill-in those physical distances), and this weekend I was gonna see my Auckland family again! After a day out with one of Melissa’s friends who drove us to my auntie’s house, memories of all those family reunions started coming back to me: here was the corner dairy Carolita and I would get ice creams from, and here was the driveway to her old house where we once placed her Barbie (and Ken) dolls into an ice cream container and gave them a bath by pointing the garden hose at them at full blast, enjoying watching them fly. Melissa and I walked up the stairs to the front door, knocked, and we were greeted by my rather short (albeit standard height for a Filipino woman I reckon) auntie. “Hello Tita Bubot!” I replied, returning the hug. Melissa and I entered the house that looked almost exactly as I remembered it, dropped our stuff in the spare rooms, and talked with my auntie while we waited for Carolita to arrive. It turned out we were all going out to dinner as it was one of my nieces’ birthdays. “Hey Scanner,” said Carolita rather casually when she came through the door to see us all waiting for her. “Carolita!” I shouted, standing-up to greet my cousin. “What the hell happened to your hair? !” I asked, letting the first thing that came to mind out through my mouth, before hugging her super tight. We were all ready to go to dinner, but before we left, Carolita pointed to a piece of furniture in the corner of the living room - a small, round, black leather(? )-covered seat - and asked if I remembered that. “Wait, what?! ?” I said, laughing loudly and walking over to her and the seat cover. 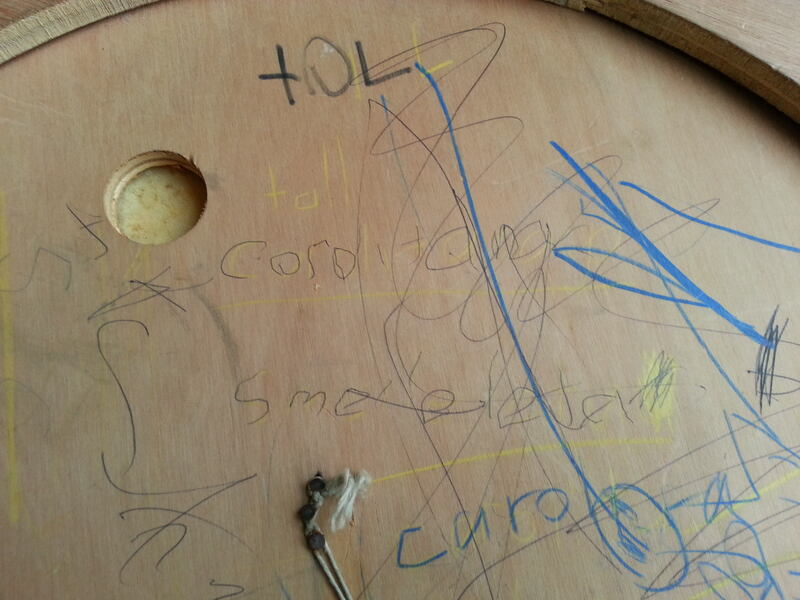 Sure enough, on the underside of this relatively mundane piece of furniture, inside the house I spent several of my Christmas / New Year’s holidays in during the first half of my life, and written in terrible handwriting, was one of my digs at my cousin. I suddenly recalled my ‘poos and wees’ and ‘girls are yucky’ phases, and, even though I still failed to remember writing these exact words, thought that this was definitely something a much younger version of me would have done. “I gotta take a photo of this,” I managed to say between fits of laughter, laden with the memories of years gone by and the comfort that comes with confronting a light-hearted piece of one’s own forgotten history.